India’s 1st Crowd Funded Electric Bike Launched; Runs 11Kms in Just 1 Rupee! It is not just Elon Musk who is serious about electric vehicles; there are passionate Indian entrepreneurs who are trying with their own capacity to revolutionize this niche within India. And the best part is that, it solves a very grave problem of electric vehicles: recharging option. Encouraging is the fact that Milltex Engineers’ is a company based out of Coimbatore, and they manufacture textile manufacturing spare parts since last hundred odd years; and they have no such prior experience of venturing into the vehicle manufacturing, forget about electric vehicles. Spero has been designed as a cycle, which can convert into an electric bike. It has a range of 100 kms while in electric mode, and can deliver 0 to 25 km/hr speed within 10 seconds. As per the company, under normal conditions, once the battery is fully charged, the electric bike can run for 100 kms, and one unit is usually spent to charge it fully. Even if we assume Rs 9 per unit of electricity bill (it’s Rs 6 in Noida; Rs 7.5 in Delhi), Spero will deliver a knocking punch of only 9 paisa per km expense, or Rs 9 for 100 kms; which is very economical and feasible for a country like India. 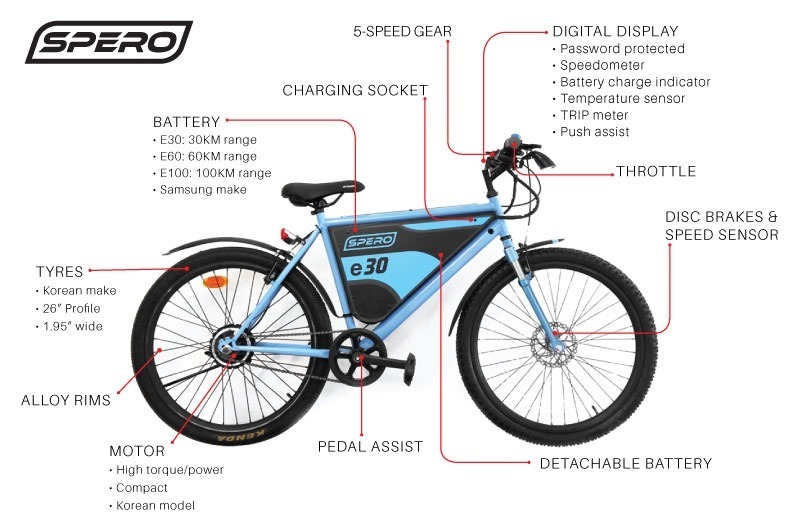 Weighing around 24-30 kgs, Spero has a mobile charger, cruise control (max speed can be locked), electronic display and powered by 5 gears in the electric mode. It Can Recharge By Pedalling! As per various auto-experts, the biggest problem with electric vehicles is the lack of options to charge the vehicle. Elon Musk is creating loads of charging points across USA, to solve this problem. But in India, it is still a long way to go. The best part about Spero is that, it can be charged while pedalling as well. The 48 volt Lithium ion detachable battery which powers this eBike can be charged while pedalling; and within 3 hours of such labor, 20-40% of the battery can be recharged. Hence, this can be the real wild card for Spero, as this feature can assist its users tremendously. The company has listed their project on a crowdfunding platform called FuelADream, where 73% of the target has already been achieved. Out of Rs 30 lakh requested, the crowd has chipped in Rs 21.94 lakh till the time of writing. Contributors are able to get massive discounts on the purchase as well. 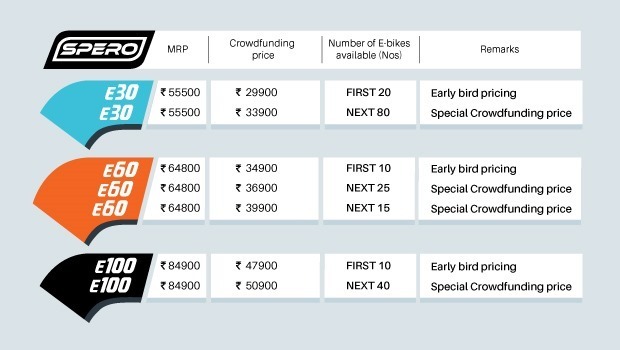 The first 50 bikes manufactured would be under three variants: e30, e60 and e100 which will cost Rs 55,500, Rs 64,800 and Rs 84,900 respectively. Contributors at FuelADream platform can get these bikes at a discount of 40%. Under National Electric Mobility Mission Plan 2020, Govt. of India is planning 70 lakh electric vehicles on Indian roads by 2020. Self driven projects such as Spero can be the ultimate lever to execute Indian Govt.’s ambitions when it comes to electric vehicles. But we need more funding, more participation and more contribution to make it a success. "India’s 1st Crowd Funded Electric Bike Launched; Runs 11Kms in Just 1 Rupee! ", 5 out of 5 based on 29 ratings.